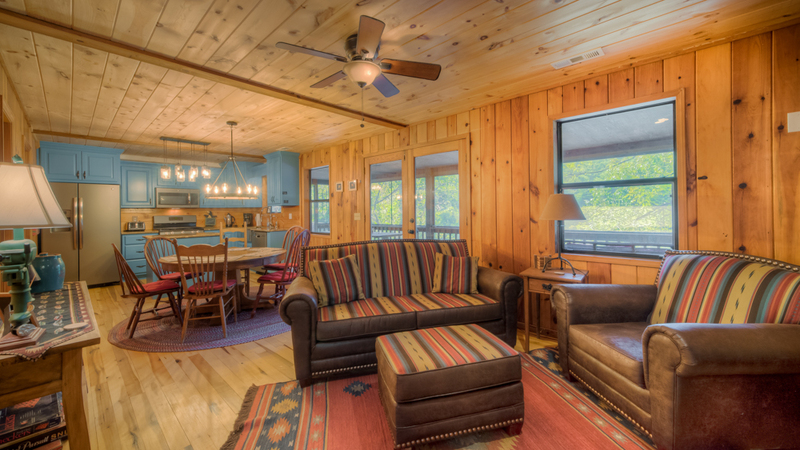 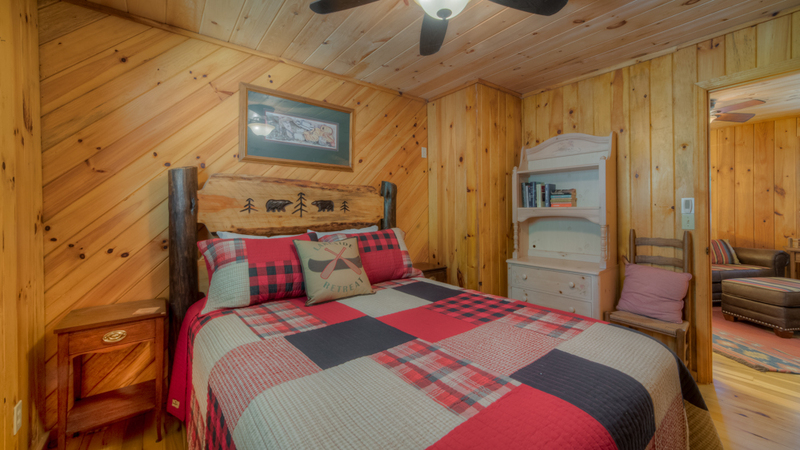 Inside the bright and airy cabin, the atmosphere is warm and welcoming; with cheery pops of color in the furniture, quilts, and cabinets and all the comforts and amenities of a private resort. 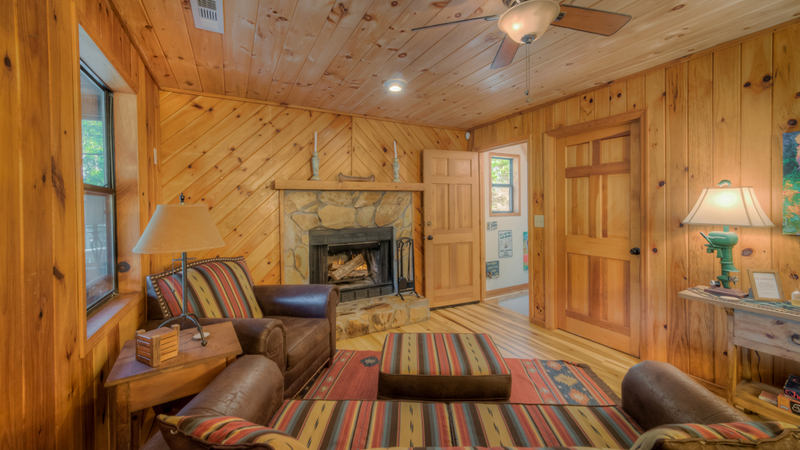 Built of knotty pine in tongue and groove construction, it has indoor and outdoor wood-burning fireplaces to keep you toasty and ceiling fans to keep you cool. 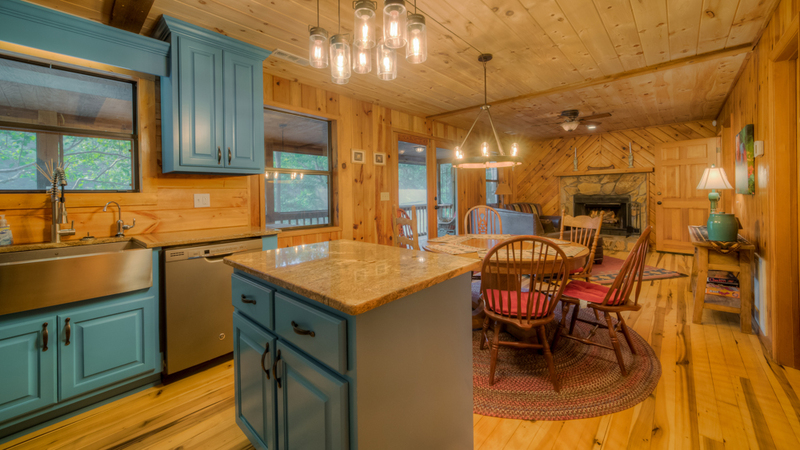 The brand-new, well-equipped kitchen features, granite countertops, a farmhouse sink, stainless steel appliances, gas stove/oven, refrigerator with icemaker, a crockpot, drip coffeemaker and a handy island, with a dining table that seats six. 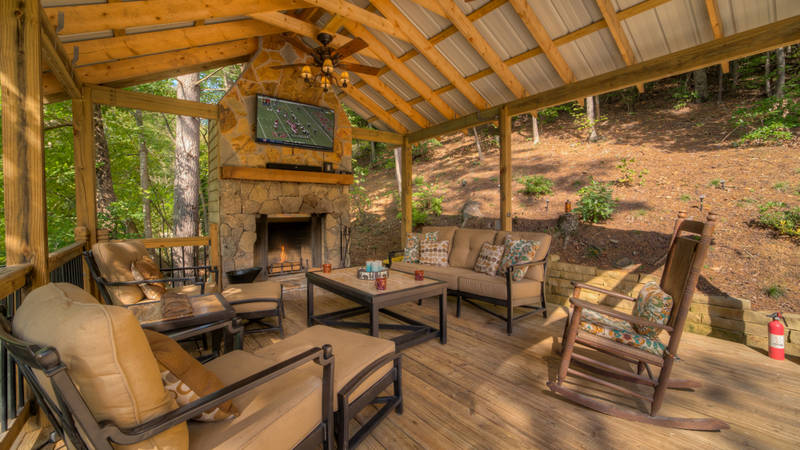 Rather dine outside? 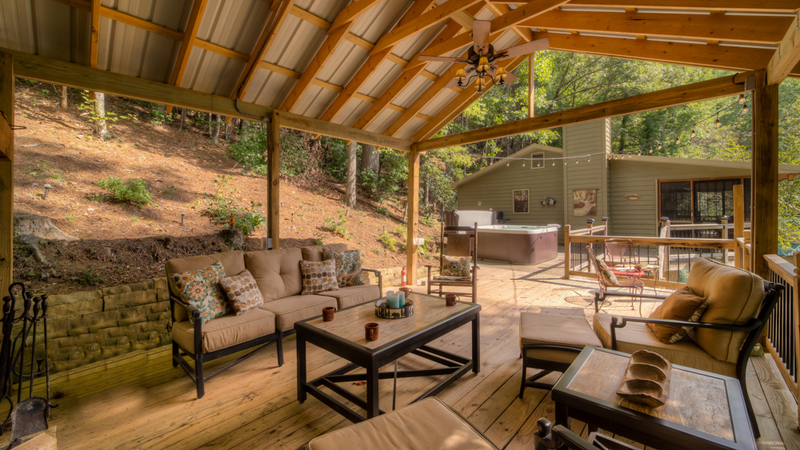 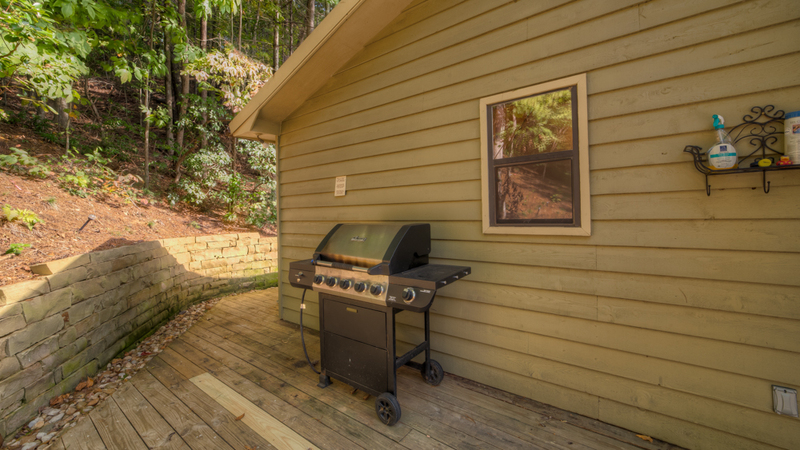 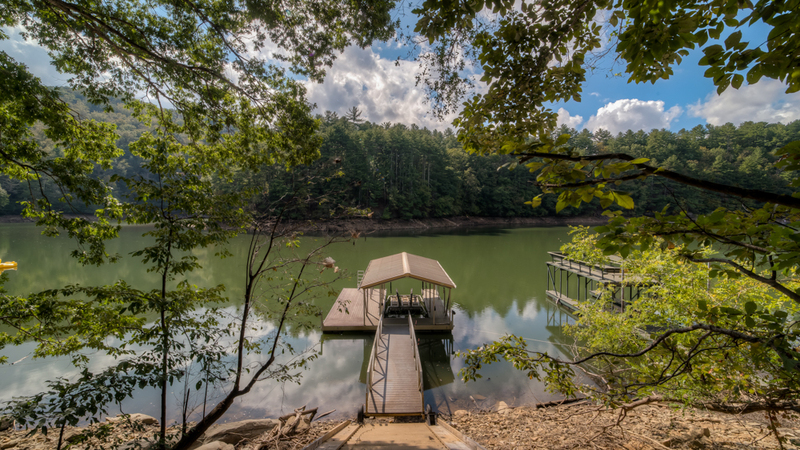 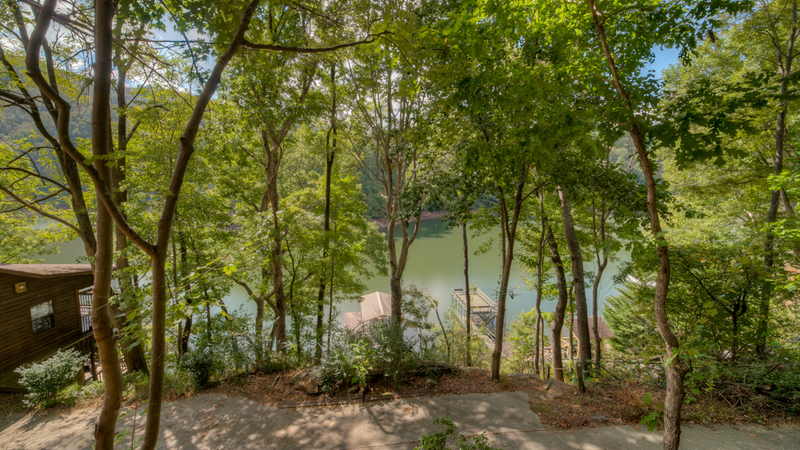 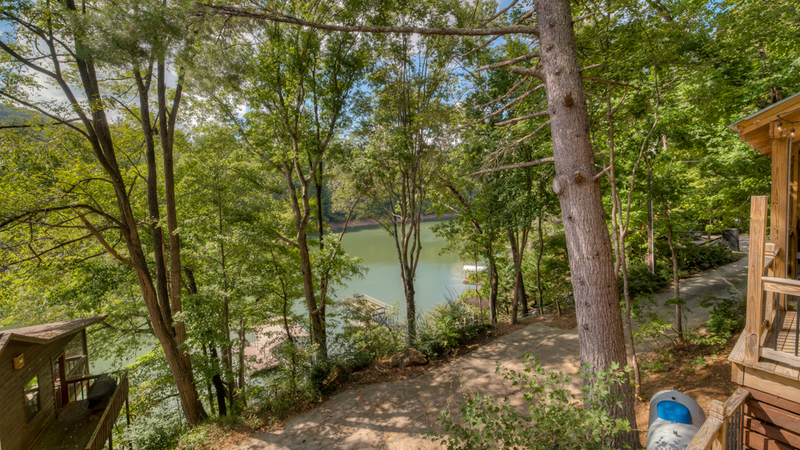 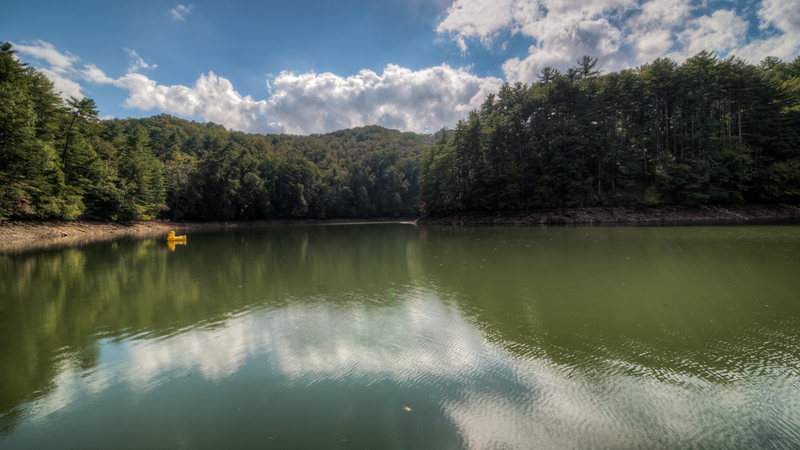 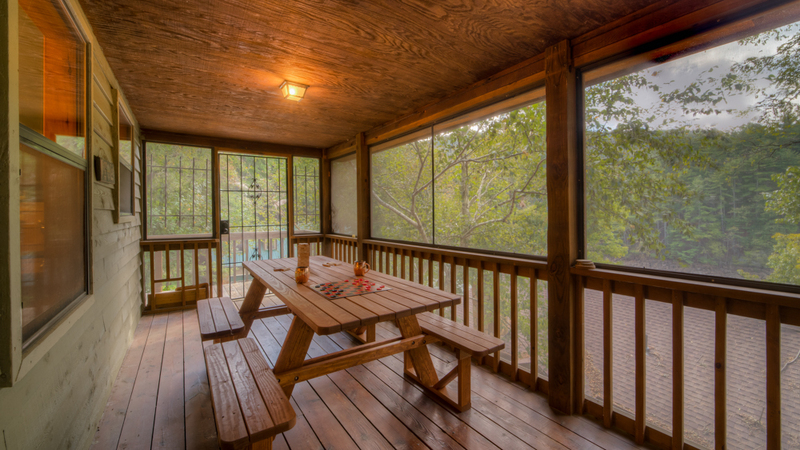 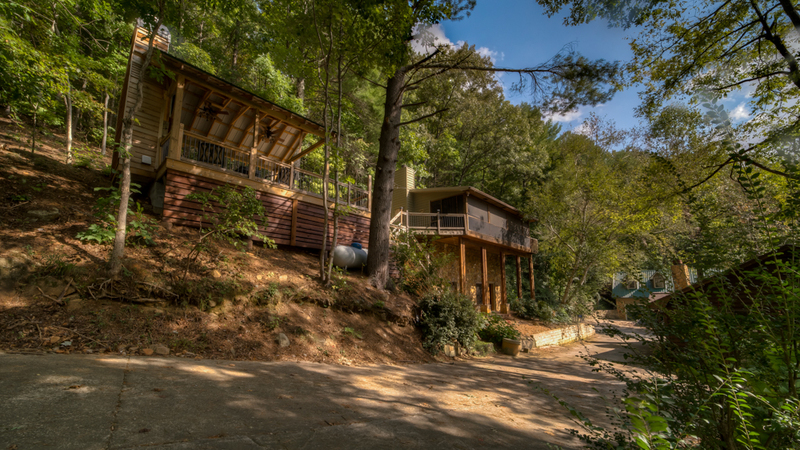 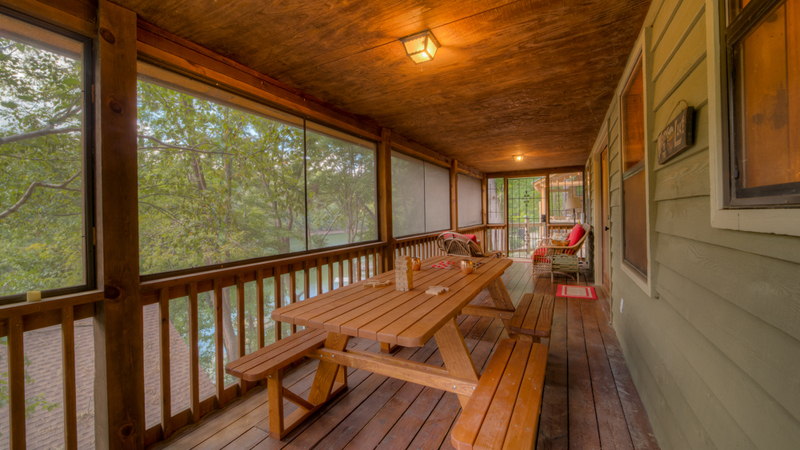 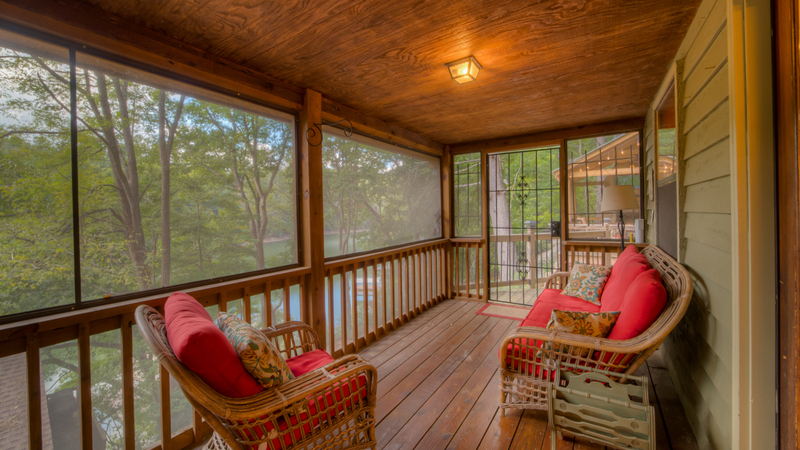 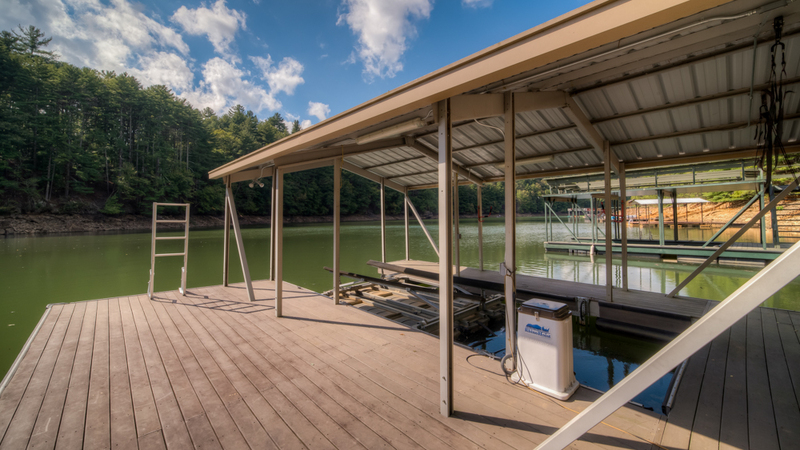 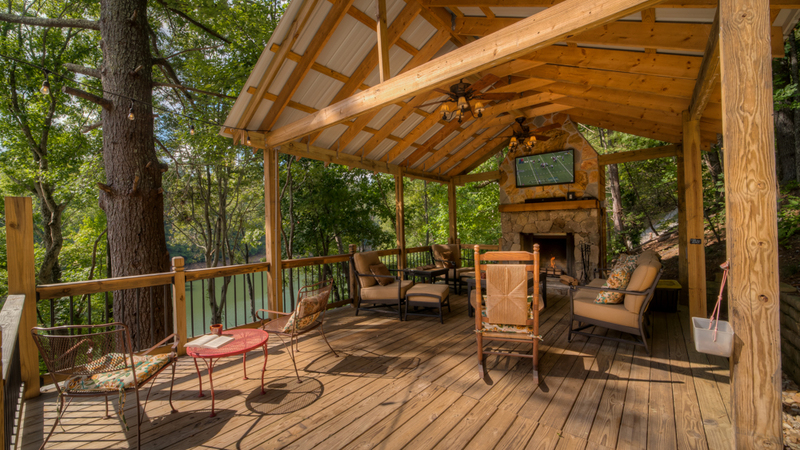 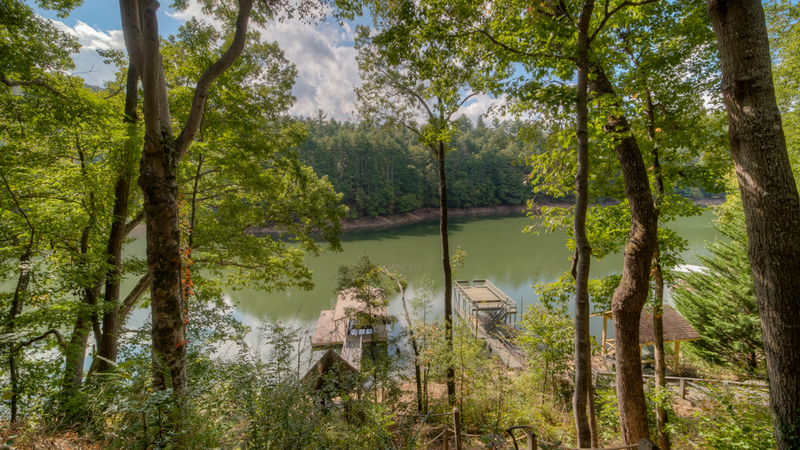 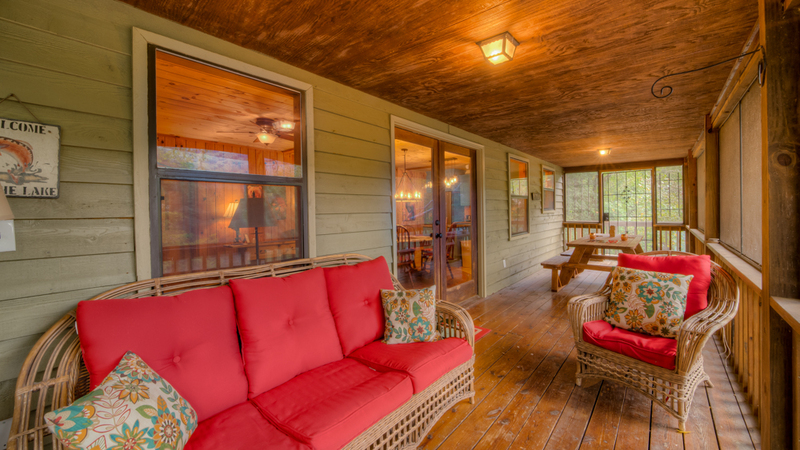 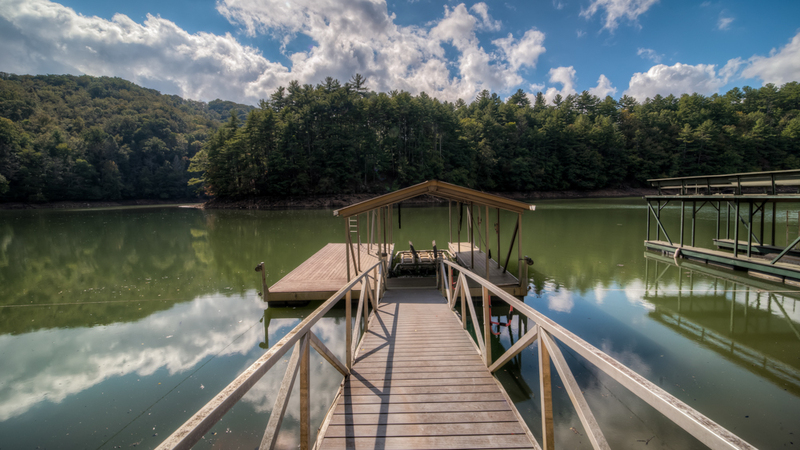 No problem, as Lake Blue Ridge Overlook was designed for outdoor living, with a gas grill, six-seat picnic table, 50” TV with soundbar, and plenty of comfy seating on the screened porch. 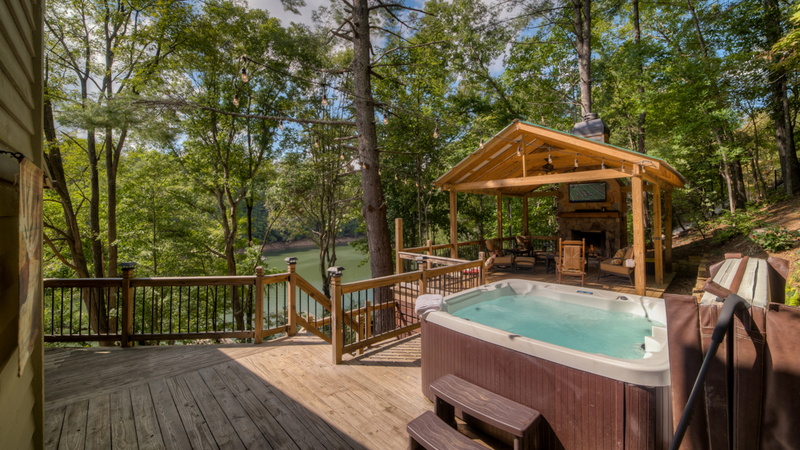 You can soak those sore muscles to your heart’s content in the hot tub, which has room for five and a fabulous view of the lake. 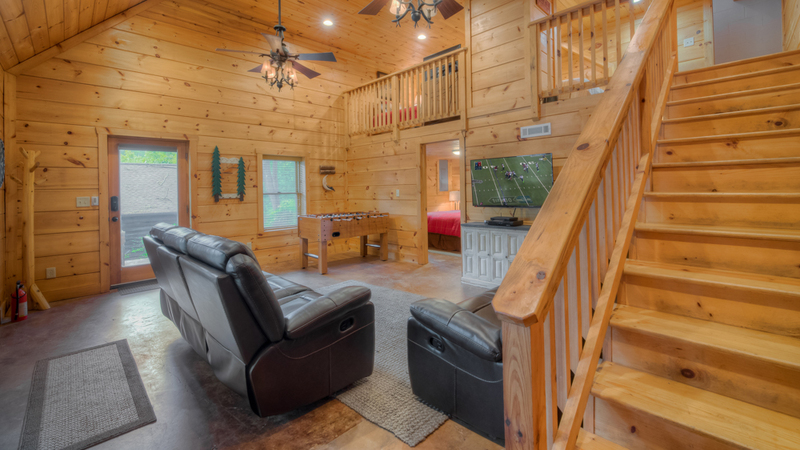 More fun awaits inside, where you’ll find a dartboard, foosball table and 50” flat screen TV in the game room. 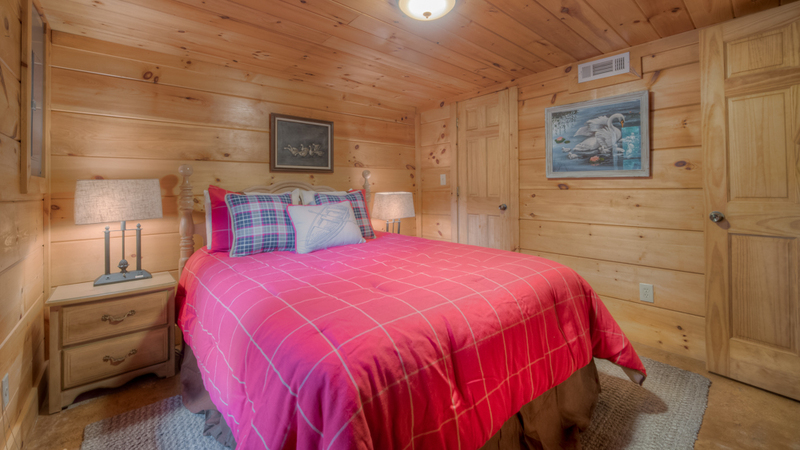 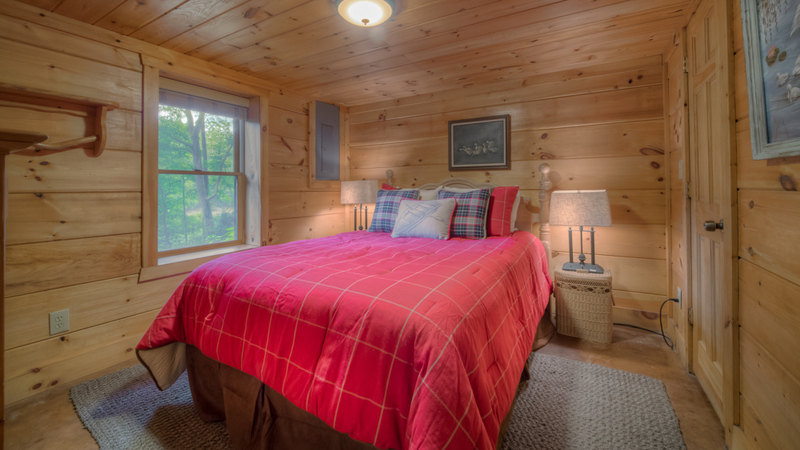 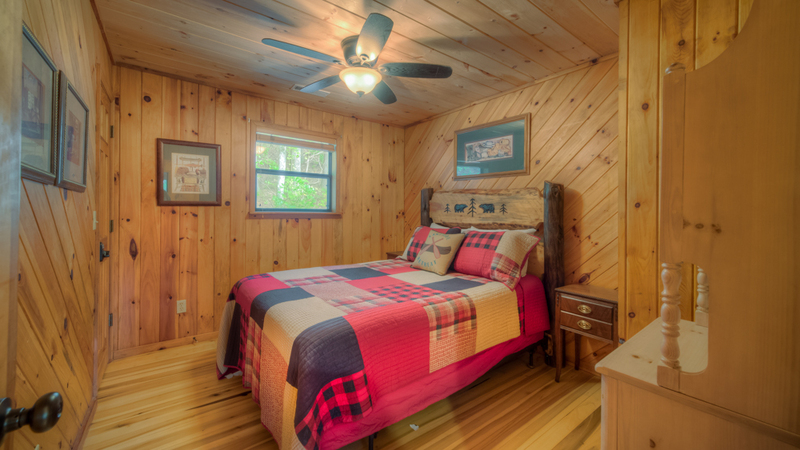 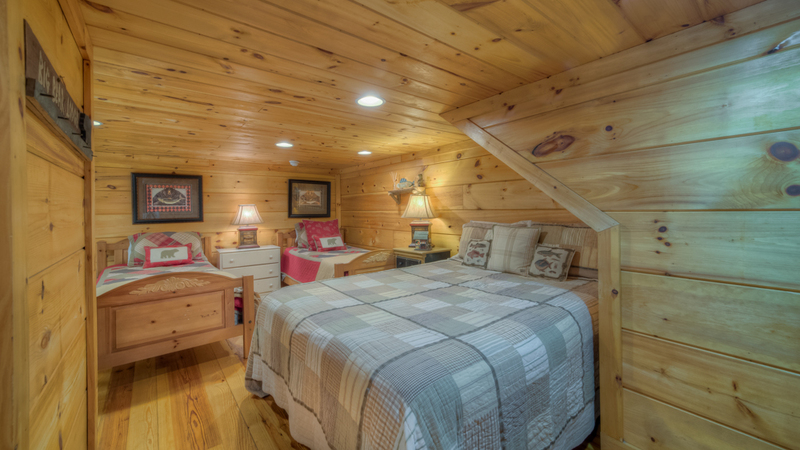 At bedtime, you’ll have your pick of three spacious bedrooms with queen log beds, colorful quilts, and walk-in closets. 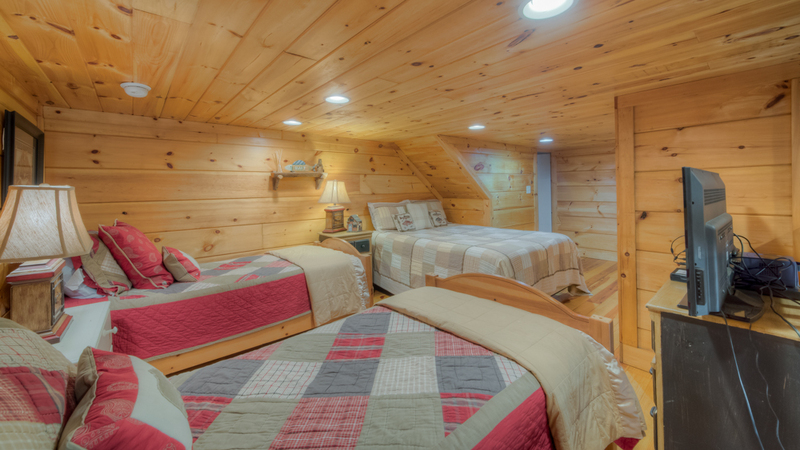 If you have kids, there’s another queen bed and a pair of twins in the loft, with a 32” TV to keep them entertained. 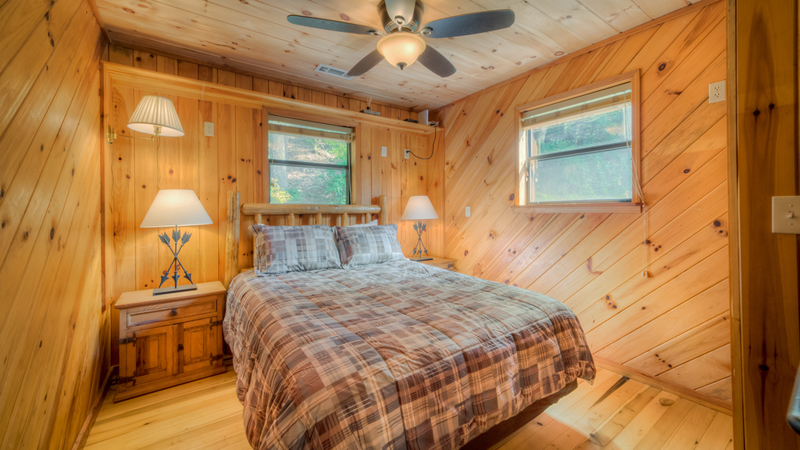 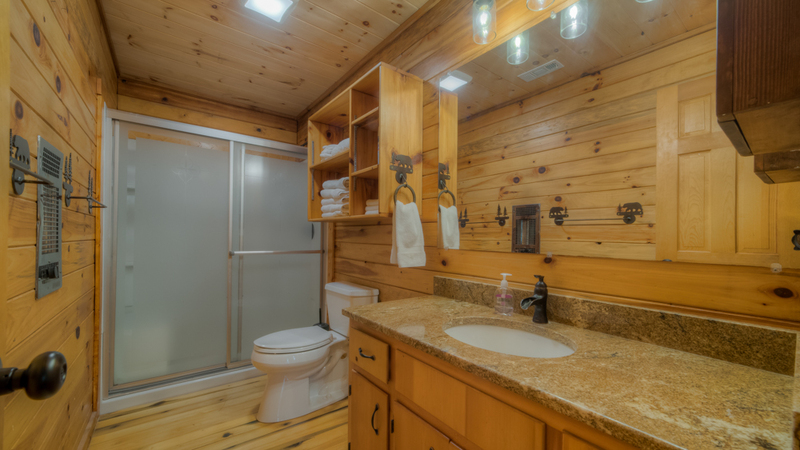 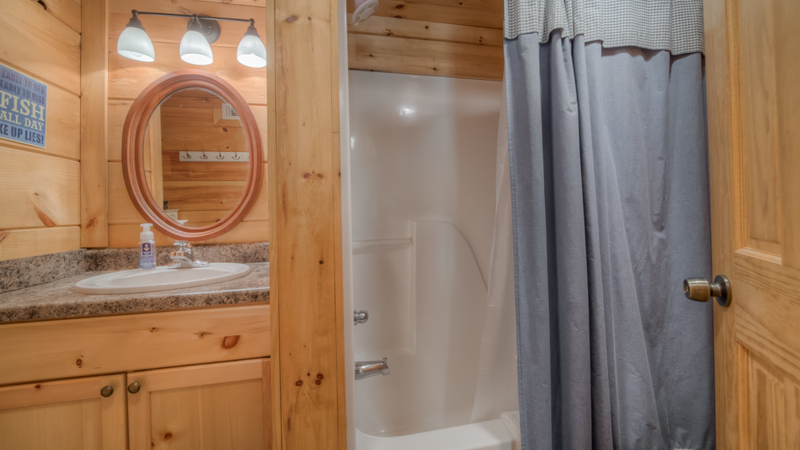 The cabin has two bathrooms: one on the main floor with shower, and the second on the lower level with tub and shower. 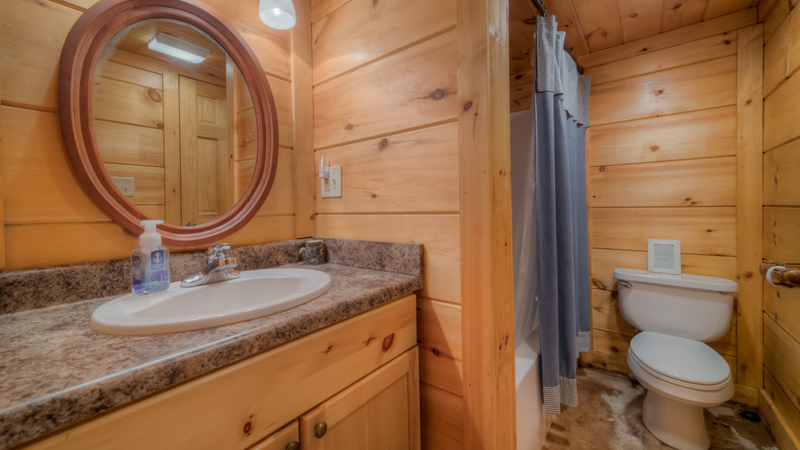 You’ll find a washer/dryer downstairs too. 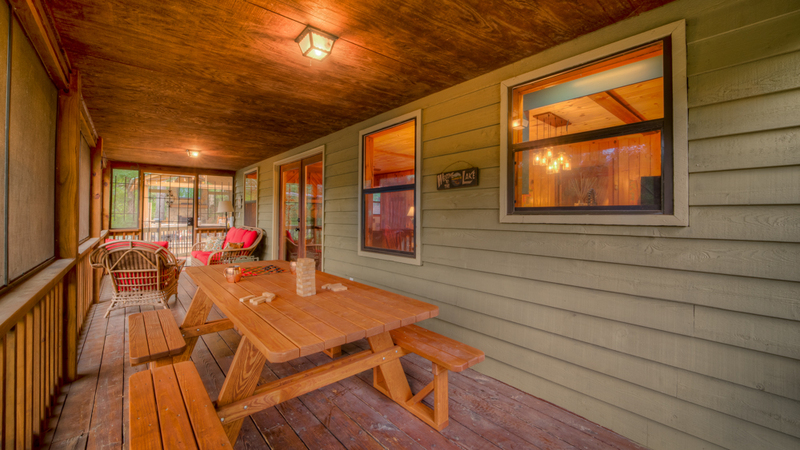 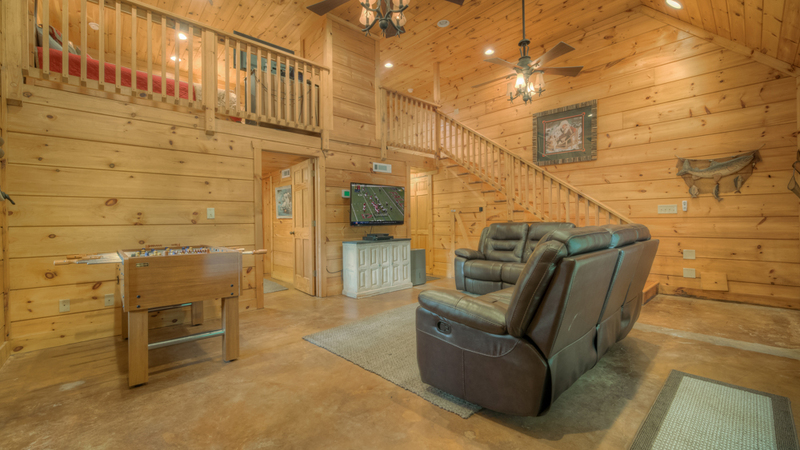 The cabin has wireless Internet, so feel free to bring your favorite devices. 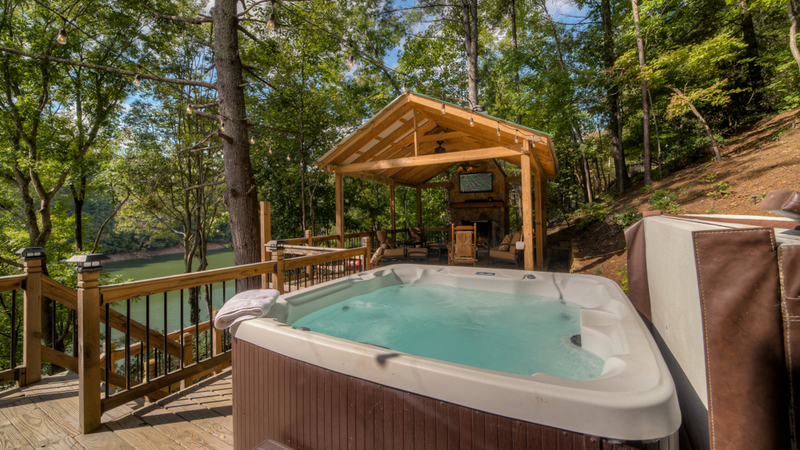 But be sure to unplug them so you can truly enjoy every minute of your time in this magnificent, magical lakeside retreat. 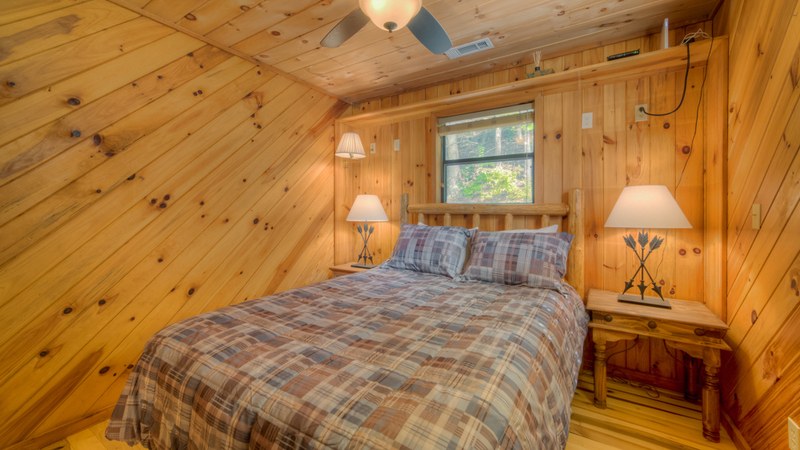 Your vacation adventure awaits! 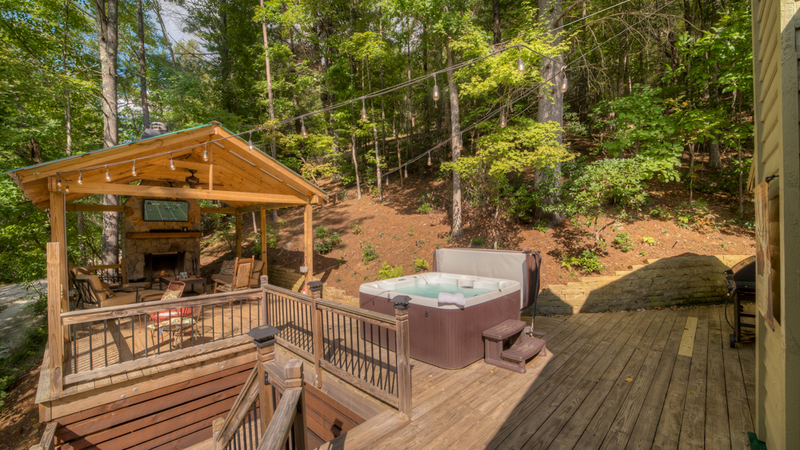 01/19 - It was a great experience ..fun time in the hot tub, warm cozy home environment. 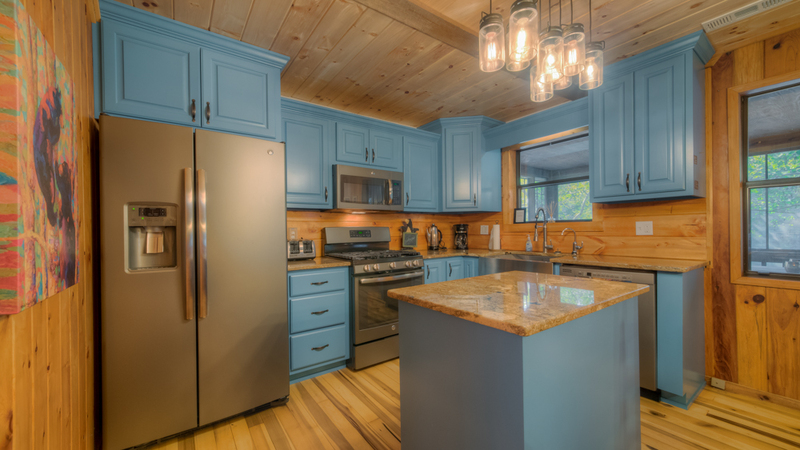 Really excited about the kitchen being fully stocked. 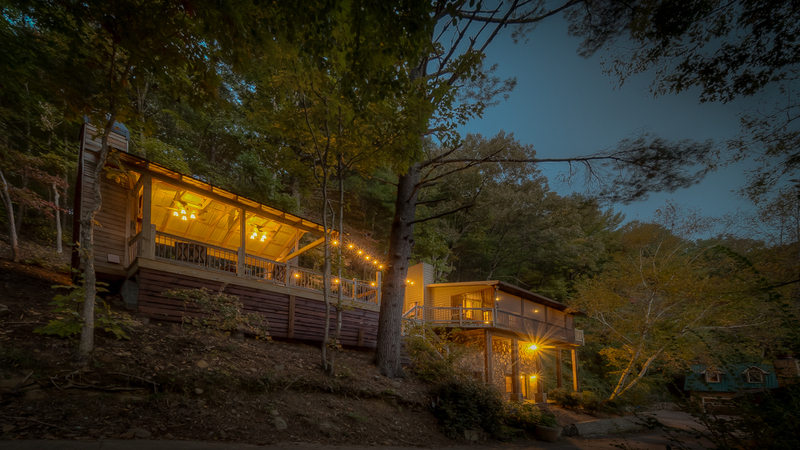 Great staff really made us feel welcome. 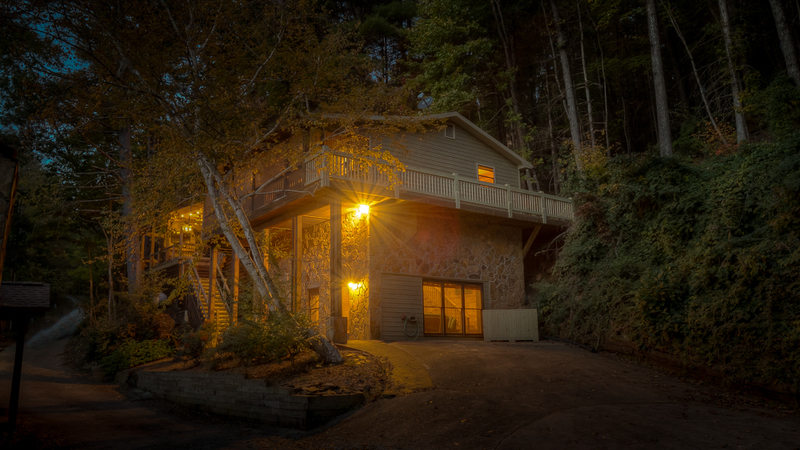 It was an overall great experience, will definitely book again.